24-inch Magnetic Tool Bar is rated to hold 20 pounds of tools per running inch! Made of heavy gauge enameled steel, this is not your average tool bar! 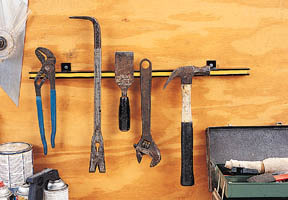 Hammers, ratchets, open end wrenches, chisels, pliers . . . this bar will hold them all without dropping. 24-inches x 13/16-inch x 1-1/8inches with two welded-on hanging brackets, spaced 16-inches on centers to line up with wall studs. Screws included.